Wherever you look there is a story. It’s obvious when reading a book or watching a film, but stories underlie everything we do. Adverts, business pitches, conversations in a coffee shop, all are stories in action. In this series we explore how storytelling is applied in the real world by talking to people with first-hand experience of using stories at work or in their creative lives. 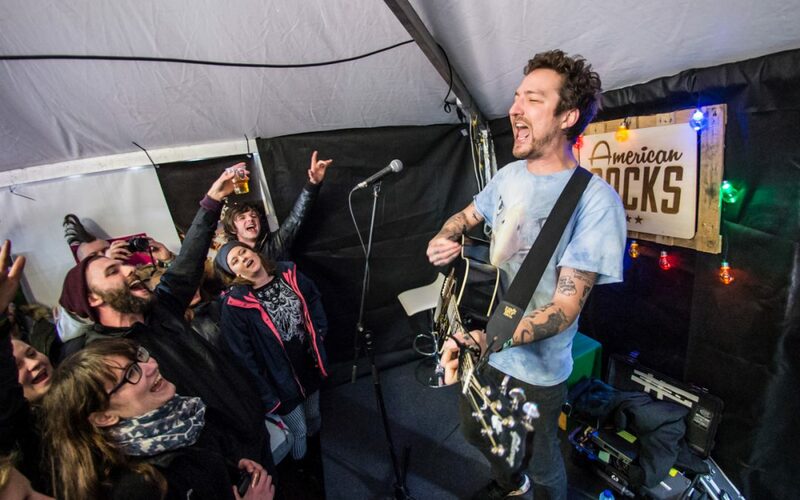 In this first instalment, we speak to singer-songwriter Frank Turner. Frank is known for his engaging concerts and story-centred lyrics. We wanted to explore how he incorporates storytelling in both his songwriting and his performances, and why this bonds him so closely with his fans. John Yorke Story – Hi Frank, thanks for taking time out of your hectic tour to answer some questions. Your songs demonstrate that you are a consummate storyteller, and your performances seem to adhere to story structure. Is this conscious, and why? Frank Turner – I’m not sure it’s completely conscious. In songs, sure, you work on an arc if it’s a narrative song, and even if it’s not you get a feel for the architecture. With the way I write setlists, well, I think a similar thing takes place, though it’s not necessarily conceived exactly as such. A set has to take your audience on a journey of sorts. My sets tend to evolve over time, and you start feeling your way through them pretty instinctively after a while. I think it makes for a better show, and it conforms to whatever deep instinct for story it is that humans seem to have. JYS – When did you become aware of story as an aid to performance and communication? What inspired you? FT – A little while back I accepted that I am, above all, an entertainer. Some musicians and artists shy away from that word, but I think that’s misguided. By using the term to describe myself, I put myself in a lineage that includes vaudeville, the theatre, music hall and so on. Once you’ve crossed that mental bridge, you can think more holistically about the nature of what you do on stage. It’s not just playing a bunch of songs in a row, there’s structure and nuance in the way you present your art. Performance is a separate art to songwriting, although arguably a meta one. JYS – Do you agree that we all use stories to perceive and explain the world? Perhaps not all the time, but yes, sure. JYS – Why do you think story is important? Is it an effective way to connect with an audience, for example? FT – At some point in this discussion we enter the realm of human psychology and indeed human nature, neither of which do I feel much qualified to pontificate upon. As mentioned, I think that people tend to have a feel for story of some kind, for purpose and resolution in their understanding of the world around them. It’s by turns comforting and useful for comprehension, though I suspect it also has its pitfalls. Tapping into that sense is one of the more direct techniques available to the artist, regardless of their medium. JYS – Your effectiveness at interacting with your audience and taking them on a journey with you are evident. They trust you, listen to you and obey you. You give that trust back – with the crowd surfing for example – and seem to bring all members of the audience together, physically and emotionally. FT – I try very hard to make my audience understand that I’m interested in dialogue rather than monologue. It’s something I took from the iconoclasm of punk rock as I understood it when I first discovered it. A good show is a collective endeavour between the stage and the floor, and the performers are the current conch-holders within a community, as opposed to some separate caste. Hopefully that comes across. JYS – How aware are you of structure when planning a gig? Do you think in terms of acts, of protagonist/antagonist and the midpoint for example? FT – I’m not sure the language I use is quite so dramatic or technical, but there’s some serious thought behind the structure and flow of my setlist. You need to decide how to start, how and when to reach certain peaks and troughs, but make sure you bring the audience with you. And, you work towards a denouement. There are other things to consider as well – which songs come from which album, what key they’re in, whether anyone has to swap instruments or capo positions or whatever between them, how many you want to run in a row, where any set-pieces you might have worked out will fit, and so on. JYS – Do you think in three or five acts? Why and can you give examples? FT – I’d say 5, or even 7, though again I’m not sure it’s quite so precise in my head, and it depends on how long I have to play. We usually start strong, try to move up a gear in the second block, get into some deeper cuts next, then move into a more solo section (book ended by more down-beat band numbers). Then you build up to a first, slightly false climax, before falling back down and returning for an encore that nails the audience to the floor! JYS – How important is resolution after the climax of a performance? FT – That would depend on what you were aiming for. Personally, I feel like the resolution is the final applause, and the sense of (hopefully) enjoyment, redemption or whatever that people take away from the show. JYS – Frank, you’ve given us a great insight to how using story affects your music and performances. Thank you! To learn why story is so important and how to apply it, explore the John Yorke Story online courses, which apply the principles of five-act structure as set out in John Yorke’s book, Into the Woods.